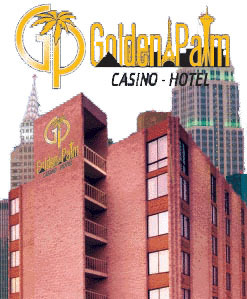 Golden Palm Hotel Las Vegas will only accept reciprocal links with web sites that are subject related. As web site owners we frequently seek out subject related sites, and sites that offer value and/or useful information to our customers and visitors. We find this to be the best way to identify related sites that help visitors find us, you and the information they need. Most importantly, by adding a reciprocal link you realize the positive effects of search engine ranking. Your site will be added to our links page within 7 days. Your site is not a gambling site, it is not obnoxious or adult-only. title: "Golden Palm Casino Hotel Las Vegas"
preferred description: "Golden Palm Casino Hotel Las Vegas. Clean, comfortable, friendly hotel casino and close to all Las Vegas has to offer IS Your Gateway to Las Vegas Adventure. Online reservations and Call Center." reciprocal link must be the url of the actual page where our link appears. We will verify our link on your site, then send email confirmation that your link is up on ours. Your link will be up within 48-hours if received Monday-Thursday, and within 72-hours if received Friday-Sunday. We periodically re-verify our links. If our link disappears, we will take your link off our site. If your site is a gambling site, obnoxious, adult-only or not relevant, we will do nothing.